I LOVE this as a stand for both my keyboard and mouse. You have the choice of a small or large incline, I chose the small for now but may up it. The wrist cushion is very comfortable and durable. I replaced the included mousepad with an old one I own, as it was made of a thin and flimsy cardboard that did not stick very well to the stand itself...it was pretty strange and not at all what I was expecting for the price or brand. Regardless, it's a very nice stand, and I'm glad I made the purchase. Sleek in appearance and operation, these platforms are designed with tapered wrist rests and rounded corners for comfort beyond compare. Includes incredibly soft gel wrist rests. 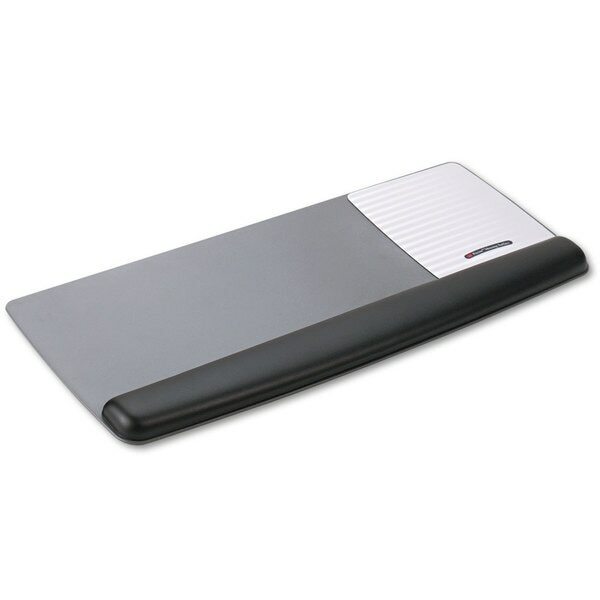 Leatherette wrist rests are easy to clean and feature antimicrobial product protection to inhibit the growth of microorganisms, such as bacteria, on the product surface, that can cause stains, odors and product degradation. Wrist Filling Material: Gel; Mouse Pad/Wrist Rest Type: For Keyboard and Mouse; Color(s): Black/Silver; Theme: Solid Color. Dimensions 1 inches high x 25 1/2 inches wide x 10 3/5 inches deep.